Kisses can come with a lot of baggage. Sure, we all want to think of them in their ideal form, as an expression of love and warmth, but in between hello and goodbye, the shades of meaning behind a kiss can carry a wealth of emotional entanglement. 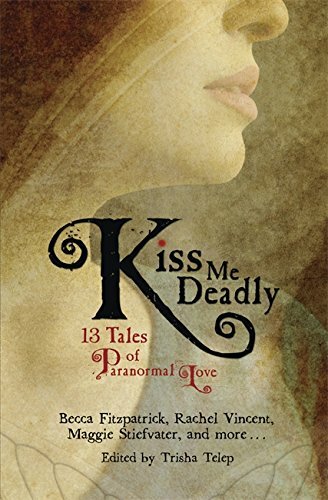 The 13 stories in this anthology come from some of the best-known young-adult fantasy authors in the U.S. and the U.K., and they take the most potent of kisses deep into supernatural terrain, exploring emotional connections between humans and everything from angels (fallen, that is) to zombies. The collection opens strongly with Michelle Zink’s (Prophecy of the Sisters series) “The Assassin’s Apprentice,” about rival demon hunters whose egos may be an even bigger obstacle than the powers of the demon they’re both trying to kill. Other unwilling team-ups can be found in Karen Mahoney’s “The Spirit Jar,” (a teenage vampire with a chip on her shoulder and a half-breed genii to defeat an afarit (necromancer); and Michelle Rowan’s “Familiar,” about a reluctant teenage witch and her feline familiar, who turns out to be much more than just a cat. Expanding on the world of her Rampant series, Diana Peterfreund’s “Errant” offers an alternate medieval Europe where no noble wedding contract can be properly sealed without a unicorn hunt—no matter how unwilling the bride and the unicorn hunter. Standouts include Maggie Stiefvater’s powerful “The Hounds of UIster,” a bitter story of friendship and betrayal right out of Irish legend, while “The Spy Who Never Grew Up,” by Sarah Rees Brennan, gleefully offers a neatly faceted mash-up of the lighter parts of Ian Fleming’s Bond and the darker parts of Peter Pan, seen through the eyes of a decidedly modern “Wendy.” The collection closes neatly with Daniel Waters’ disturbing and heartbreakingly human look at living with zombies. It’s a great pleasure to find works from such an array of writers gathered into one book. Telep has assembled stories that run the gamut from humorous to haunting, scary to thoughtful. Both teenage and adult fantasy readers will find plenty here to savor, while those new to the genre can be assured of a solid introduction to some of the best YA writers at work today.